The NOVES Adult Enrichment Committee would like to invite all interested to an evening of conversation and comedy. 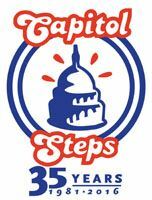 On Saturday Sept 22, the Capitol Steps will be performing at the Hylton Performing Arts Center on the Manassas campus of George Mason University. The NOVES group will meet for dinner at a restaurant in Manassas at 6pm before the show. Ticket prices run from $30 - $50 and will be available for individual purchase starting Aug 1. If there is a group of at least 10 people going, we can get a 10% discount for a group purchase. Please let Iris Woodard know if you wish to join the group. If we have more than 10 interested, Iris will make the group ticket purchase. Iwood1349@cox.net or 571-398-4710.